With Taken (2002), David Rokeby has created a work in perpetual composition. 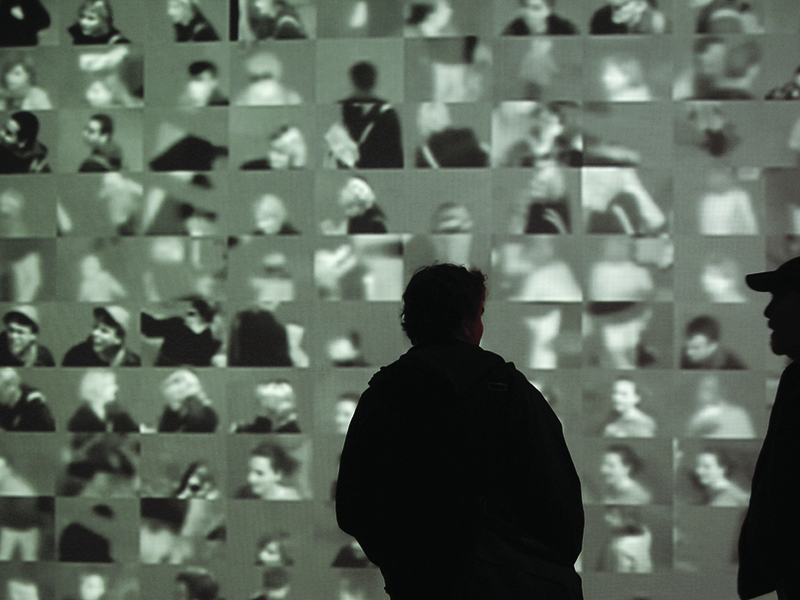 The images are involuntarily generated by viewers and recorded in real time in the exhibition space. These silhouettes and faces are assigned a random order by software that projects them in continuous loops on two enor- mous screens. Somewhere between real and virtual space, the work disrupts viewers’ contemplation of the piece, turn- ing them into both watchers and anonymous observers and questioning the body’s relationship with space. David Rokeby was born in 1960 in Tillsonburg, Ontario, Canada. He lives and works in Toronto, Ontario, Canada. Since 1982, David Rokeby has been developing multimedia devices in which the exhibition space and the presence of viewers are shaped by multiple temporalities. Incorporating surveillance cameras (Sorting Daemon, 2003), motion detectors (Silicon Remembers Carbon, 1993–2000), and computer programs that he wrote, Rokeby draws on various ways of apprehending places as well as the movements that temporarily inhabit or run through them. He employs technological processes that also constitute contemporary explorations of the rela- tionship between the body and space. His real-time recordings and their (slightly out-of-sync) transcriptions to the screen feature images of viewers, who do not have even the slightest influence over the effects produced. With the size of simple monitors (n-Cha(n)t, 2001) or large-scale projections (Seen, 2002), Rokeby’s works offer mirror images of viewers and their environment, with its share of the unpredictable and haphazard (Taken, 2002). Viewers’ interaction with the technology is never controlled, while virtual and real information intersect and are juxtaposed in free associations of words, images, and sounds generated by computer software. Rokeby puts the logical and formal systems of computers to the test via human reactions in the enclosed area of the exhibition space. David Rokeby’s works have been featured in the exhibition e-art (MMFA, Montreal, 2007) and in numerous group shows (Algorithmische Revolution, ZKM, Karlsruhe, 2004; Profiling, Whitney Museum, New York, 2007). Rokeby represented Canada at the 2002 Venice Architecture Biennale and the 2004 São Paulo Biennale. David Rokeby, Taken, 2002. Installation view, National Art Museum of China, Beijing, 2008. Photo: David Rokeby. Courtesy of the artist.